Now that the days are getting a bit shorter and the nights longer, we should consider how this might impact what is a routine part of dog ownership, going for a walk. When we are treated to more hours of sunshine during the spring and summer months, the added visibility makes it much easier to have a safe and leisurely walk with our pets. Not only is it easier for you to see potential dangers along your way, it’s also easier for those dangers to see you coming as well. There are distinct advantages to having a regular walk routine within a given neighbourhood as you, your dog, and your surroundings become familiar with one another. You begin to anticipate who or what you might see along the way, just as neighbours and drivers begin to look out for you on your walk. When the evenings get darker you carry these expectations with you. Knowing your route well can help avoid potential pitfalls and let you adjust accordingly. Don’t like walking at dusk or in the dark? Take your walks earlier in the afternoon. Can’t walk earlier or prefer the solitude of the nighttime dog walk? Here are several measures you can take to ensure that you both get the most out of the experience. 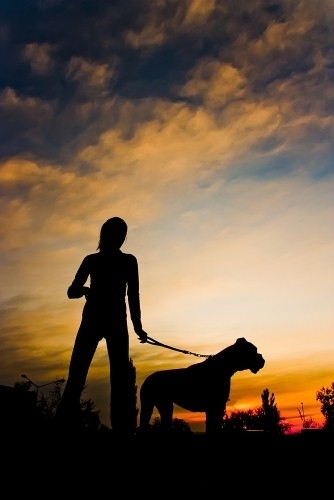 When walking with your dog after dusk, drivers can have a hard time seeing you, particularly if you and your dog are not wearing the appropriate gear. Clothing should be brightly coloured and/or reflective. There are also highly reflective leashes, collars and harnesses for dogs available for purchase, or LED blinkers that will make you and your dog stand out clearly for drivers. These items are highly recommended, even if you have the advantage of street lamps to light your way. Some areas take on a whole new persona when the night comes.If you’re apprehensive about a portion of your route when it’s dark, find a safe path that you’re comfortable with. Bring along a flashlight and your cell phone just in case things get a little too dark. Practicing safe dog walking is about keeping you both safe, after all. For more safe dog walking tips or find out where to buy reflective accessories, contact your veterinarian today.